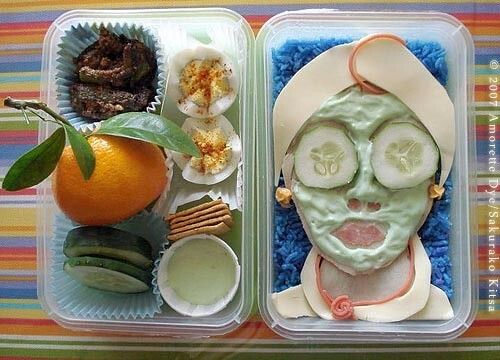 Spa Bento by Flickr user Sakurako Kitsa. Click image to view source. I'm getting really into food pictures, even making some of my own (to be revealed). 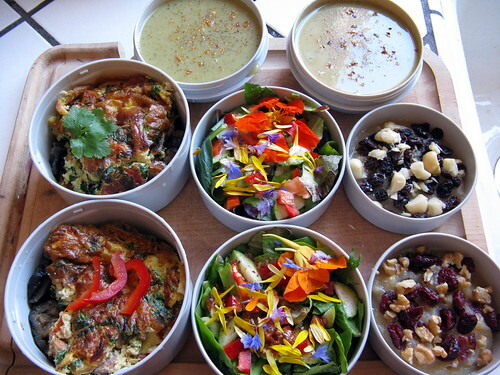 The Bento Box group(s) on Flickr are a great place for food inspiration, aesthetically and nutritionally. 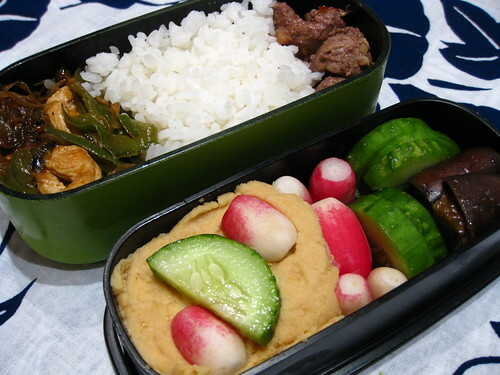 bento 8.14.09 by Flickr user Mamichan. Click image to view source. The construction of a bento meal ranges from pragmatic to wildly artistic. It works for any kind of food, from anywhere in the world. Brad's Lunch and Dinner, by Flickr user flit. Click image to view source. I've been in a bento-mindset since I've been spending a lot of time at my new studio at the OKCCoCo. I'm getting a ton of ideas from other bento fans. 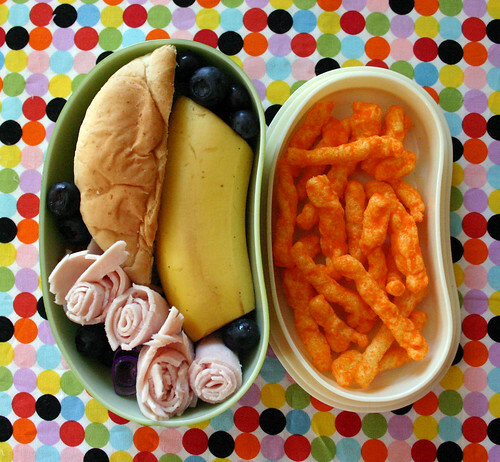 Preschooler Bento #227, by Flickr user Wendy Copley. Click image to view source. What's this bento thingy? Think of it as the classier predecessor to the tv dinner. Explore more Bento Box Flickr pools here. See more of what I've Found on Flickr. The Society of Illustrators of Los Angeles blog has posted a profile of me and my work. Click here to read it. Thank you, SILA, for providing your members with an online gallery, and helping the public get to know us a little better. Smorgasbord by Flickr user CharlesFred. Click image to visit on Flickr. Say it with me, illustrators: "Photo references are good. Use them." Using references is not copying, it is not cheating. Image references are tools. What's an easy way to make sure you're not trodding on another artist's toes? Search within the Creative Commons. What is Creative Commons? The Creative Commons license is a legal way for creators to easily share their content with the public. It is not a negation of copyright. There are different kinds of licenses depending on the type of content (music, images, literature, software, and so on) and how the creator wishes to share this material. I release my work under a Creative Commons license (there's a link over in the left column of this page) because I believe that information and influence should (and do) flow freely among creators. The license does not prevent me from earning income from my art. I still own what I make. Creative Commons makes it easier for me to share it with others. You can read more about Creative Commons here. Even with the Creative Commons license, copyright and usage is a slippery slope. When in doubt, contact the creator, ask permission, and give them credit. The Flickr Creative Commons search is a fantastic tool for finding photo references for drawing, painting, illustration, or the medium of your choice. You need a Flickr account to use it - it's easy to sign up. Click on the word "Search" in the upper right-hand corner, then click on "Advanced Search." Enter your search terms and parameters, then scroll down to the bottom of the search form, where you will find the Creative Commons box. Click "Only search within Creative Commons-licensed content." And go. You can also browse by license. UPDATE: Here's a tip from optimization expert Tim Ferriss. Do a Creative Commons search on Flickr, then sort the results by "Most Interesting." You'll get the best images first. The Flickr Commons (sounds the same, but isn't) is another bountiful image resource. Here are some goodies I found there. My collaborative sketchbook pal Karo recently posted her favorite Flickr groups for gathering collage material. They are Collage Images, Vintage Illustration, and Mid-Century Illustrated. These groups collect and display images that are old enough to be public domain, or with no known copyright restrictions. Some of the images in the Collage pool are contemporary creations whose owners have provided them for use by others. The ownership of certain original ephemera objects (which are scanned and uploaded to Flickr) are sometimes in question, but this community of artists (usually) acts responsibly in investigating and attributing the sources of these images. Here is a discussion thread on that topic. Illustration of cafeteria cherry pie by Maira Kalman, from her New York Times column And The Pursuit of Happiness. See below for links to Kalman's column. At Ease, Kalman's latest installment of her New York Times column. Read Kalman's latest column here. Order The Illustrated Elements of Style here. Check out some more of Maira Kalman's many illustrated books. 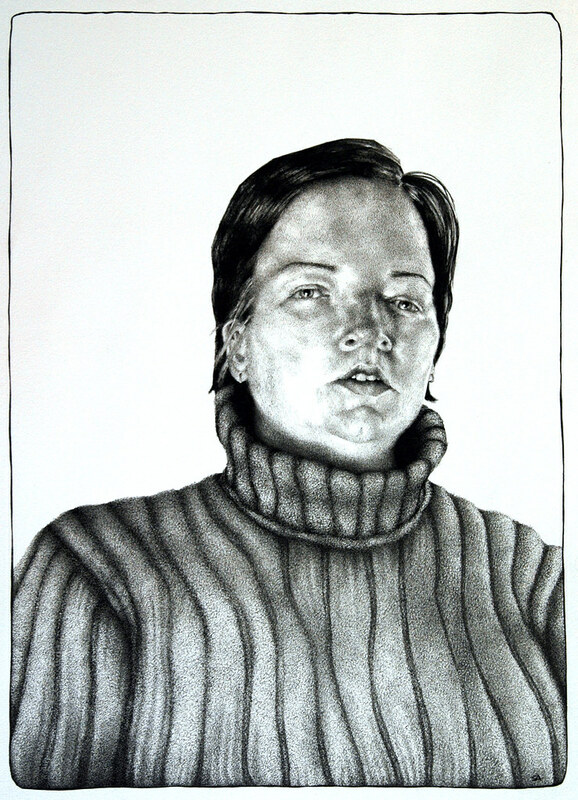 Romy, pigma micron on Rives BFK, 22 x 28 inches, 2009. Click image to see it on Flickr. This portrait of romy owens (whom you may have read about here) was created for the Seeing Other People show earlier this year. This piece will also be in the 24 Works On Paper show. Yes, it did take a long time, about 40 hours. Special thanks to Kelsey Karper for getting the photo for me. Were you looking for a sign? Here's a sandwich. otherwise noted. Some rights reserved.